Terry M. Anderson, 74, of Rock Island, died Sunday, March 31, 20019, at Clarissa C. Cook Hospice House in Bettendorf. Visitation will be from 5 to 7 p.m. Thursday, April 4th, at the Cambridge Chapel of Stackhouse-Moore Funeral & Cremation Services. A funeral mass will be held at 11:00 a.m. Friday, April 5th, at the Trinity Anglican Church in Rock Island, with a visitation from 10 to 11 a.m. prior to the service. Father Chris Wilson and Father Jason Bowden will officiate. A luncheon will follow the service and then burial will be in Rosedale Cemetery, Cambridge, with military services. Memorials may be made to the Trinity Anglican Church. Terry Michael Anderson was born December 26, 1944 in Geneseo, the son of Richard W. and Marcella Hubler Anderson. 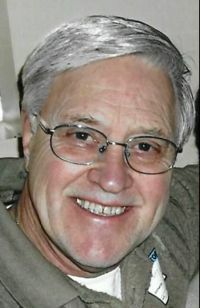 He was educated in Woodhull schools and graduated from AlWood High School in 1963. He served in the U.S. Navy from 1966 to 1968 and his last duty was aboard the USS Robert A. Owens. His marriage to Peggy Johnson took place on September 4, 1965 in Woodhull. He later married Faye Moss Brody on April 29, 1989 in Rock Island. He worked most of his adult life as a Journeyman Electrician in the Quad Cities area and was a member of the I.B.E.W. Local 145 of Rock Island. Terry was also a member of the Trinity Anglican Church and fulfilled his lifelong dream of becoming a Deacon on March 14, 2019. He spent many hours volunteering at the church and enjoyed playing senior softball, wintering in Port St. Lucie, Florida, and spending time with family and friends. Those surviving are his wife, Faye, four children, Keith Brody, Jr., Fallon, Nevada, Kelli (Randy Schwab) Morland , Woodhull, Kristin (Darren) Wight, Knoxville, and Matthew (Kristy) Anderson, Lynn Center, and six grandchildren, Trysten Brody, Ellie, Ava, and Maya Wight, and Preston and Makenzie Anderson. Other survivors include three brothers, Dennis (Janice) Anderson, Galesburg, Mark Anderson, Swedona, Rick (Marcy) Anderson, New Windsor, and a sister, Trudy (Kelly) Atchison, Alpha. His parents and a brother, Tim, preceded him in death.